The Amazon Rainforest is named after the Amazon River, the live force of the jungle. It is a unique ecosystem that harbors 1/3 of all living species in the world! The total extent of this incomparable tropical jungle is estimated in comparison to the complete land area of the United States. 28 billion gallons of its waters flow into the Atlantic every minute, diluting the salinity of the ocean for more than 100 miles offshore The Amazon watershed is home to the world’s highest biodiversity. As well, it is home to more species of plants and animals than any other terrestrial ecosystem on the planet, and its biodiversity is so astounding that scientists regularly discover new species of flora and fauna. Your Amazon journey takes off on arrival in Iquitos, were we will pick you up and take you to our vessel. In the following days, you will experience an ideal combination of natural wonders, dramatic scenery, indigenous cultural history, and a relaxed self-contained way to explore the rainforest while sightseeing nature at its best. Here in the Pacaya Samiria National Reserve, you are about to explore one of the world’s most intriguing environments. Flora and fauna are abundant and time seems to stands still. If seeing the glorious flooded forest and getting close-up looks at lots of birds and mammals (and enjoying a slightly cooler temperature) sounds attractive, then the flooded season might be the best choice. (Remember: Despite its name it only gets about 10% more rain than falls in the dry season). If jungle hikes, seeing exotic migratory birds perch on trees as they pass through Amazonia, still having the chance to see monkeys and other mammals, and going on great fishing expeditions top your list, you might be happier choosing the hotter, less rainy dry season. Perhaps the best solution of all: choose one, and we hope that you will like it so much that you may want to return to experience the other season in the Amazon as well. Located on the second deck these two master suites of 340 square feet and a private deck of 320 square feet are a little smaller than the ones before, but quite spacious too. Shares the same comforts as our deluxe suites but without whirlpool baths; they features panoramic windows from floor to ceiling and the same amenities as the deluxe suites. 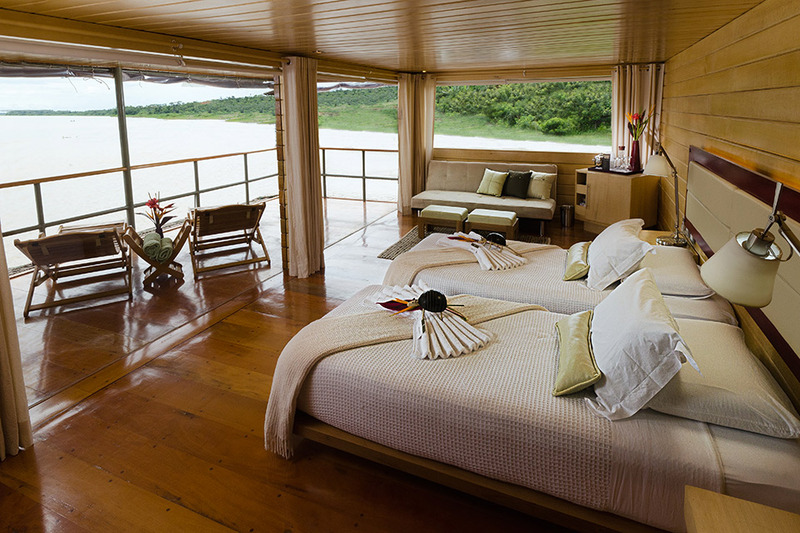 Located on the main deck, this two spacious suites of 360 square feet, features a king size bed, (or separate twins) who are wrapped on 180° panoramic windows from floor to ceiling, mini bar, in-suite seating area with a sofa bed (may be converted in one additional bed), fine Peruvian linens (with a threat counts in hundreds), environmentally friendly amenities, silent A/C units, hot water, hair dryer, safe deposit box and internal communications system. Our new addition is private terraces of 320 square feet with private cold-water whirlpool baths, being the first and only river vessel with this feature. Arrive to the Amazon city of Iquitos: Our crew will be expecting your arrival at the airport, then transfer all together in our comfortable private vehicle. We will start you off with a lunchbox as we begin the journey to Nauta. Arrive to Nauta port: Nauta is a small riverside town on the banks of the Marañon River and was the first city founded in the department of Loreto. Once we reach Nauta, you will enjoy a VIP greeting at our private port along the shores of the Marañon River where the vessel awaits you. Embarkation: Aboard Delfin, you will be served by our qualified staff who will introduce you to your exquisite and cozy suite, specially equipped with all the amenities for the experienced traveler as yourself. Orthopedic beds, pure cotton sheets, pillows of 100% pure natural latex, cotton bathrobes, air conditioning, and private bathroom with Spanish style hot water showers are all framed with a spacious private terrace we are sure you will enjoy to the fullest. Happy Hour and orientation: While the Delfin begins its initial navigation, you will enjoy the most fantastic panoramic views from the elegantly outfitted observation area located on our third deck. Our bartender will be waiting to serve you with an exotic cocktail made with regional fruits and pisco, the beloved national brandy liquor of Peru. Then, your naturalist guide will give you an overview of your journey’s schedule, activities, route, highlights, wildlife and vegetation to keep your eye out for, geographical and historical background, and other useful details. The third deck features an entertainment center which offers use for film presentations, as well as extensive literature about the area (fauna, flora, etc.) There is also a completely equipped bar so you can test any combination of regional and international liquors and aromas that the bartender will be happy to provide for you to enjoy under the spell of the beautiful Amazonian afternoons and night, and the sweet breeze of the rainforest. Moreover, should you have any doubts or questions, our guides are always fully at your service. Fundo Casual: On your first morning with us, we recommend getting up early to appreciate one of the most important zones of the Pacaya Samiria National Reserve. Never does nature seem more bountiful than in the tropics, and early rising is always rewarding since wildlife is most abundant and active with the rising of the sun. The walk at Fundo Casual jungle trail will take you deep into the rainforest on “terra firma” (non-flooded forest) where your guide will point out the dynamic creatures and vegetation of the Amazon. Be sure to keep an attentive eye open for spotting surprises! Nauta Caño: After a delicious lunch we will visit Nauta Caño Creek where you will have the chance to do some kayaking. Also, go fishing for the famous piranha, a delightful and challenging experience you won’t forget! As night approaches, your guide will take you on a night safari in search of caiman alligators and night birds. Amazon Park: This is a unique opportunity; you will get to the only Canopy Walkway in this area, an experience unequaled in the rainforest! At a height of over 25 meters (85 feet) and extending for 500 meters (one-third of a mile), the Canopy Walkway provides a view of the rainforest from the treetops, the best vantage point for observing Amazon wildlife and vegetation. The Canopy Walkway is accessible to all and requires no special skills or equipment. The suspended walkway is spread between 14 of the area’s largest rainforest trees and is one of the longest canopy walkways in the world. You will enjoy “Terra Firma” forest and you will be able to see the differences between your previous hike and this one. PM: Yanayacu Pucate: This is one of the best preserved and protected zones of the Pacaya Samiria National Reserve. Your guide will use his expert eye to pinpoint all the biodiversity of this region. If you want to interact directly with the waters of the Amazon, go out on one of our paddle boards. You will even have the opportunity to swim in the jungle river along with the famous pink dolphins! DAY 4 AM: - Amazonas village. PM: - Yarapa River. Amazonas: This village of 500 people, although not very many miles from the bigger town of Nauta in miles, is still quite removed when you have to go by canoe from place to place. On your visit to this community we will be welcomed by smiling faces and friendly people. Around the community, people who are happy to show you the process of peeling and grating cassava, while another may invite you in for a look at the tools he uses to process the rice (grown locally). A day in the life of a local ribereño is eye-opening to how far we have come in this day and age and a reflection of how simple yet rewarding life is for others. Yarapa River: Along the Yarapa River, you will get to explore this tributary intimately. Listen closely for the sounds from within the mysterious jungle. We travel down river to this wide creek that leads to an attractive hidden lagoon. As we absorb the beauty of the landscape, we will have the chance to reflect on the wildlife. Hawks, terns, herons and monkeys which are part of our everyday excursions are readily close by; in this area we will notice many more inhabitants of the Amazon, the rivereños. People being an important part of this complex bionetwork only reinforce the fact that we are part of their lives and how our presence here and now could make a difference to the future of this magical land of the Incas. Look out for specific types of Monkeys like the pygmy marmoset, squirrel monkey, and our first Monk Saki. This medium-sized monkey with the thick fur and bushy tail looks more like he is dressed for the Arctic than the Amazon. DAY 5 AM: - Disembarkation. - The Rescue & Rehabilitation Center of River Mammals (ACOBIA). - Airport departure. Disembarkation: With heavy hearts, the staff will wish you farewell as you begin your departure. At the port of Nauta, our ground crew will be waiting to take you by our private vehicle back to the city of Iquitos, about 95 kilometers journey by paved road. The Rescue & Rehabilitation Center of River Mammals (ACOBIA): On our way from Nauta back to Iquitos airport, you will visit the Rescue & Rehabilitation Center of River Mammals (ACOBIA) where you will have the chance to meet baby manatees and learn about these wonderful and docile creatures and why they are on the endangered species list. As well, there are also some other animals cared for by the center that have been rescued from capture for the intention of being turned into pets and other threatening conditions. We welcome you to donate to this ambitious organization and education center as you wish. Our land personnel will wait for you at the airport and give your boarding passes and help you check in. Airport departure: Our staff will be on hand to help you with your luggage and check in at Crnl. FAP Francisco Secada Vignetta International Airport in Iquitos. The return flight will take you directly to the city of Lima, the capital of Peru. At the security gate, your guide and Delfin crew will say goodbye. We truly hope that you enjoyed your stay and Amazon travel experience with us! The itineraries are subject to change due to weather conditions at certain times of the year. The water levels of the rivers also vary from time to time, as well as the hours of sailing. Excursions may be modified at the discretion of the Delfin crew. DELUXE SUITES: located on the main deck, this two spacious suites of 360 square feet, features a king size bed, (or separate twins) who are wrapped on 180° panoramic windows from floor to ceiling, mini bar, in-suite seating area with a sofa bed (may be converted in one additional bed), fine Peruvian linens (with a threat counts in hundreds), environmentally friendly amenities, silent A/C units, hot water, hair dryer, safe deposit box and internal communications system. Our new addition is private terraces of 320 square feet with private cold-water whirlpool baths, being the first and only river vessel with this feature. MASTER SUITES: located on the second deck these two master suites of 340 square feet and a private deck of 320 square feet are a little smaller than the ones before, but quite spacious too. Shares the same comforts as our deluxe suites but without whirlpool baths; they features panoramic windows from floor to ceiling and the same amenities as the deluxe suites. DINING ROOM: It is located on the second deck. Dining on the Delfin offers an unrivalled level of sophistication and the luxury of tasting simple and natural products. Peruvian cuisine is considered one of the worlds finest and reflects the country’s cultural diversity, the Amazon wild choice of fresh ingredients and the gentle blend of immigrant traditions have created one of the world´s most unique and delicious cuisine. OPEN OBSERVATION DECK: On the top deck of our vessel, a casually elegant setting creates a welcoming and peaceful environment for those who want to get away from it all. Enjoy luxury and comfort seated on soft, large sofas while seeing the breathtaking sights of the Amazon and brilliant star-gazing at night. 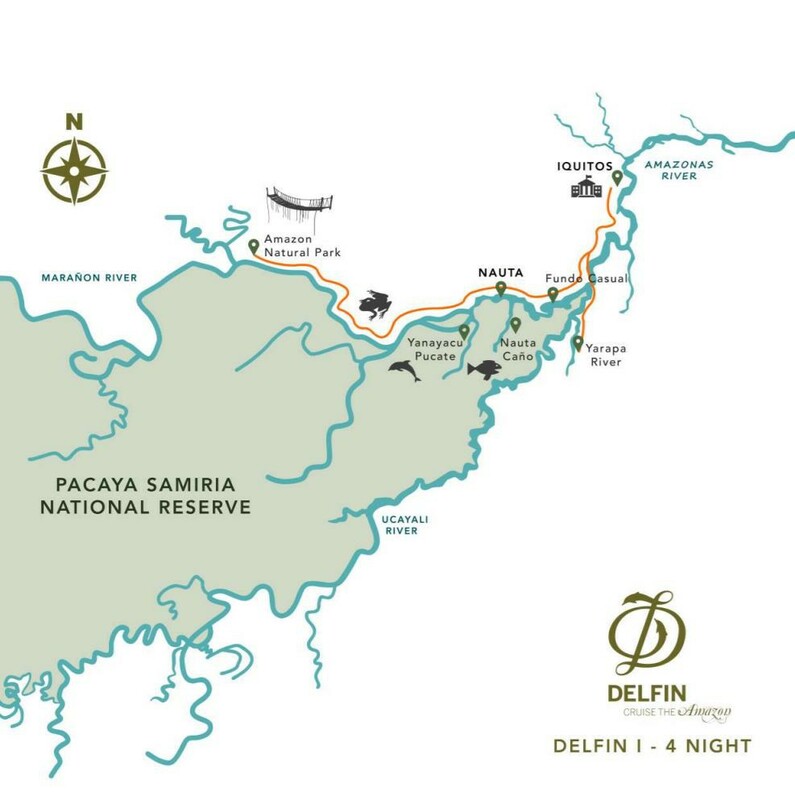 The Delfin is also equipped with an entertainment center, a range of DVDs and reading material about the Amazon rainforest, different wildlife presentations, an Xcube (for children) and a open bar offering a variety of international and local drinks. Coffee and tea is always available. The Amazon Rainforest is named after the Amazon River, the live force of the jungle. It is a unique ecosystem that harbors 1/3 of all living species in the world! ......click here to read more.